Fear: Trump in the White House is a non-fiction book by American journalist Bob Woodward about the presidency of Donald Trump. The book was released on September 11, 2018. Woodward based the book on hundreds of hours of interviews with members of the Trump administration. The book's publisher Simon & Schuster announced that it had sold 1.1 million copies (across all formats) in the first week of its release, making it the fastest selling opener in the company's history. Best known for his role exposing the Watergate scandal that led to Richard Nixon's resignation from the presidency, Bob Woodward was described by Rolling Stone's Ryan Bort as "one of the most revered and well-respected journalists in American history". Woodward and Carl Bernstein's reporting of that scandal earned The Washington Post a Pulitzer Prize and turned them into "the most heralded U.S. investigative journalists ever", according to Nick Allen of The Daily Telegraph. In his books on American presidents such as Bill Clinton, George W. Bush, and Barack Obama, Allen describes that Woodward, with "relentless and methodical reporting", "has harvested a level of detail on the internal workings of various White House administrations that no other writer can match". BBC News' Nick Bryant describes Woodward as "Washington's chronicler in chief", "one of America's most trusted journalists" and "the opposite of sensationalist." In 2013, during a dispute between Woodward and the Obama administration regarding budget cuts, Donald Trump commented: "Only the Obama [White House] can get away with attacking Bob Woodward". Real power is, I don't even want to use the word, fear. According to a September 4, 2018, article in The New York Times, the book is based on "hundreds of hours of interviews with firsthand sources, contemporaneous meeting notes, files, documents and personal diaries". Woodward taped his interviews. Woodward's research assistant was Evelyn Duffy, who also transcribed the recordings. The editor for the book was Alice Mayhew. Bob Woodward has been working with Alice Mayhew since 1974 when she was the editor for All the President's Men and this was their 19th book together. Mayhew is known for popularizing the Washington Narrative genre of books and Woodward credits Mayhew in the acknowledgments for her "brilliant engagement on the concept for the book, the pace, structure and tone." According to the book, Trump has called Jeff Sessions, his attorney general, "mentally retarded" and described him as a "dumb southerner". Trump has denied ever using "these terms on anyone", although tape recordings from 2004 contradict this assertion. CNN's editor-at-large Chris Cillizza described Fear telling a similar story compared to mainstream media reporting and other 2018 books—journalist Michael Wolff's Fire and Fury and former Trump aide Omarosa Manigault Newman's Unhinged—that the Trump administration has a "chaotic, dysfunctional, ill-prepared White House" led by Trump, "a man hopelessly out of his depth in the job, but entirely incapable of understanding how desperately out of depth he actually is". In early August 2018, Trump called Woodward about the book after the text had already been finalized. Trump told Woodward: "You know I'm very open to you. I think you've always been fair", as both of them expressed sentiments that they should have had an interview before the book was written. Trump initially claimed that no one had informed him that Woodward wanted to interview him, attributing this to his aides being "afraid" to talk to him or "busy"; but later in the call, Trump acknowledged that Republican Senator Lindsey Graham "did quickly mention" that Woodward wanted to conduct an interview. Woodward informs Trump that the book is "a tough look at the world and your administration and you", but will be "factual" and "accurate". Trump thus concludes that the book will be "negative", "bad" and "very inaccurate", because "accurate is that nobody’s ever done a better job than I'm doing as president". After several news outlets published excerpts of the book in early September, Trump claimed that Fear was "just another bad book", and that Woodward "had a lot of credibility problems ... He wanted to write the book a certain way ... I never spoke to him". Trump separately called the stories in the book "made up" and questioned if Woodward was an "operative" of the Democratic Party due to the "timing" of the book's release. Meanwhile, White House Press Secretary Sarah Huckabee Sanders released a statement saying that the book contained "nothing more than fabricated stories". Additionally, Kelly denied the book's claim that he had referred to Trump as an idiot, while Mattis called the passage featuring him "fiction" and dismissed the idea that he would show contempt or disrespect to a President. The book sold over 1.1 million copies in its first week of publication, making it the fastest selling opener in Simon & Schuster's history. When it was released, it took the no. 1 spot on The New York Times Best Seller list. The book received generally positive reviews. The review aggregator website Book Marks reported that 14% of critics gave the book a "rave" review, whilst 50% and 21% of the critics expressed "positive" or "mixed" impressions, respectively. Another 14% of the critics "panned" the book, based on a sample of 14 reviews. Lloyd Green of The Guardian described Fear as "another sober, must-read dissection of corruption and rot at the White House", a repeat of Woodward's past reporting on President Richard Nixon. Overall, Green branded Fear as telling a "chilling" story which is "big on facts and short on hyperventilation". 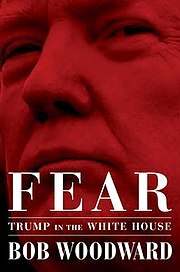 Ron Elving of NPR wrote that Fear is so far "the best glimpse we have into a White House like no other", with an account of Trump "and his presidency so devastating that it can only be described as an indictment". However, Elving expected that a portion of Trump supporters "will find this portrayal of Trump so unacceptable as to defy belief, and they may focus their dismay not on Trump but on Woodward." Elving also argues that Woodward's decision to keep his sources anonymous diminishes readers' confidence in the truth of their stories, given "the enormous weight of what Woodward is alleging." ^ Rucker, Philip; Costa, Robert (September 4, 2018). "Bob Woodward's new book reveals a 'nervous breakdown' of Trump's presidency". The Washington Post. Retrieved September 4, 2018. ^ a b c d Gangel, Jamie; Merica, Dan (July 30, 2018). "Bob Woodward's new book puts readers 'face to face with Trump'". CNN. Retrieved September 5, 2018. ^ Maher, John (September 18, 2018). "S&S Calls 'Fear' Bestselling Book In Company History". Publishers Weekly. Retrieved September 21, 2018. ^ Bort, Ryan (September 4, 2018). "Bob Woodward's New Trump Book Sounds Both Damning and Frightening". Rolling Stone. Retrieved September 5, 2018. ^ Allen, Nick (September 4, 2018). "Bob Woodward, the Watergate veteran who set his sight on Donald Trump". The Daily Telegraph. Retrieved September 5, 2018. ^ Bryant, Nick (September 5, 2018). "Why the Woodward effect damages Trump". BBC News. Retrieved September 6, 2018. ^ Morrongiello, Gabby (September 4, 2018). "Trump once mocked Obama administration for attacking Bob Woodward". The Washington Examiner. Retrieved September 5, 2018. ^ Stevens, Matt; Jason, Jason M. (July 30, 2018). "Bob Woodward's New Book Will Detail 'Harrowing Life' Inside Trump White House". The New York Times. Retrieved September 4, 2018. ^ Swan, Jonathan; Allen, Mike (September 5, 2018). "Furious Trump trapped by hundreds of Woodward tapes". Axios. Retrieved September 6, 2018. ^ a b Blake, Aaron (September 4, 2018). "Transcript: Phone call between President Trump and journalist Bob Woodward". The Washington Post. Retrieved September 5, 2018. ^ Duffy, Evelyn. "About the Editor". Open Boat Editing. Retrieved September 11, 2018. I am Evelyn Duffy, owner of Open Boat Editing. I have been editing and transcribing in the D.C. area for over 10 years. Since 2007 I have been a research assistant for Bob Woodward and have helped research, edit, and produce four of his New York Times best-sellers. ^ a b Korda, Michael (1999). Another Life: A Memoir of Other People. New York: Random House. pp. 364–367. ISBN 9780385335072. ^ Woodward, Bob (2018). Fear : Trump in the White House (First Simon & Schuster hardcover ed.). New York, NY: Simon & Schuster. p. 357. ISBN 9781501175510. OCLC 1046982157. ^ Herb, Jeremy; Gangel, Jamie; Merica, Dan (September 5, 2018). "Bob Woodward: Trump's aides stole his papers 'to protect the country'". CNN. Retrieved September 5, 2018. ^ Cohen, Marshall (September 5, 2018). "Bob Woodward book: Trump called Sessions 'mentally retarded'". CNN. Retrieved September 5, 2018. ^ a b Choi, David (September 5, 2018). "Trump denied calling Jeff Sessions, or anyone ever, 'mentally retarded' — but old records show he has". Business Insider. Retrieved September 5, 2018. ^ Cillizza, Chris (September 5, 2018). "The real reason Bob Woodward's book is so damaging for Trump". CNN. Retrieved September 5, 2018. ^ a b Coglianese, Vince; Enjeti, Saagar (September 4, 2018). "Exclusive: Trump Says Bob Woodward Has 'A Lot Of Credibility Problems'". The Daily Caller. Retrieved September 5, 2018. ^ Zwirz, Elizabeth. "Trump asks if Bob Woodward is 'Dem operative' amid explosive book details". Fox News. Retrieved September 5, 2011. ^ Rascoe, Ayesha (September 4, 2018). "'Idiot,' 'Unhinged,' A 'Sixth-Grader': Aides Fault Trump In Explosive New Book". NPR. Retrieved September 4, 2018. ^ Mitchell, Ellen (September 4, 2018). "Mattis calls Woodward's reporting on him 'fiction'". The Hill. Retrieved September 4, 2018. ^ Perlberg, Steven (September 21, 2018). "The Future Of Publishing Is Just Books About Donald Trump Forever Until You Are Dead". Buzz Feed News. Retrieved September 21, 2018. ^ Stelter, Brian. "Bob Woodward's 'Fear' debuts at No. 1 on The New York Times' best sellers list". CNNMoney. Retrieved October 4, 2018. ^ "Fear: Trump in the White House". Book Marks. Retrieved November 4, 2018. ^ Green, Lloyd (September 8, 2018). "Fear review: Bob Woodward's dragnet descends on Donald Trump". The Guardian. Retrieved September 11, 2018. ^ Elving, Ron (September 9, 2018). "Bob Woodward Paints A Presidential Portrait Like No Other For Donald Trump". NPR. Retrieved September 11, 2018. Fear: Trump in the White House. Simon & Schuster.